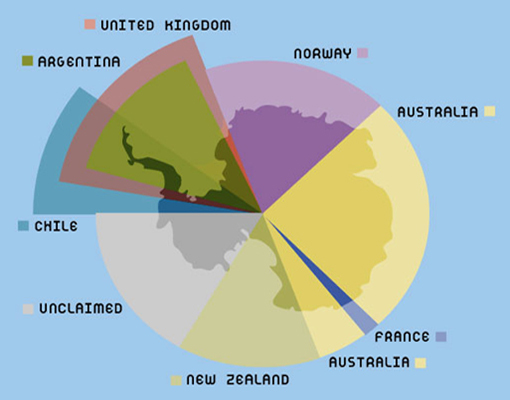 There are no countries on Antarctica but some countries claim certain parts as shown on the map below. Antarctica is an ice covered landmass. There are no countries in Antarctica though some countries have claim to various areas. Total landmass is 14.0 million square kilometres or 5.4 million square miles. Antarctica covers 3.0% of the earth's surface and 10.0% of the earth's landmass. As of 2017 there are about 1,000 scientists living in Antarctica. 0.0% of the world's population live in Antarctica. Antarctica circles the South Pole. The landmass is bordered by the Indian Ocean, the Atlantic Ocean and the South Pacific Ocean. Antarctica has around 90 percent of the fresh water on the Earth's surface in its ice sheet. For half the year, April to September, it's dark all the time and you can't see anything outside. For the other half it's light all the time and all you can see is snow and ice and, possibly, a penguin or several million. It may look as though it is miles from anywhere but, if parts begin to melt and slide into the sea, water levels will rise and some countries around the world might disappear..